Third wave coffee. That's how several articles describe the current hype for flat white's, filter coffee, chemex, aeropress etc. Whether this has rather a negative connotation than a positive one is left open, but all I can say is that I am a big friend of a proper, well-prepared and aromatic cup of coffee. Whether flat white, filter coffee or a cold brew for hot days, I am keen to explore and taste new things. As long as the price reflects the quality, I am willing to spend a bit more for a cup of black gold than you would normally do at other cafes. If it is just for the name, though, and a flat white will cost you 6€ just because it is a flat white, I am switching to the critics side of the 'third wave coffee'. 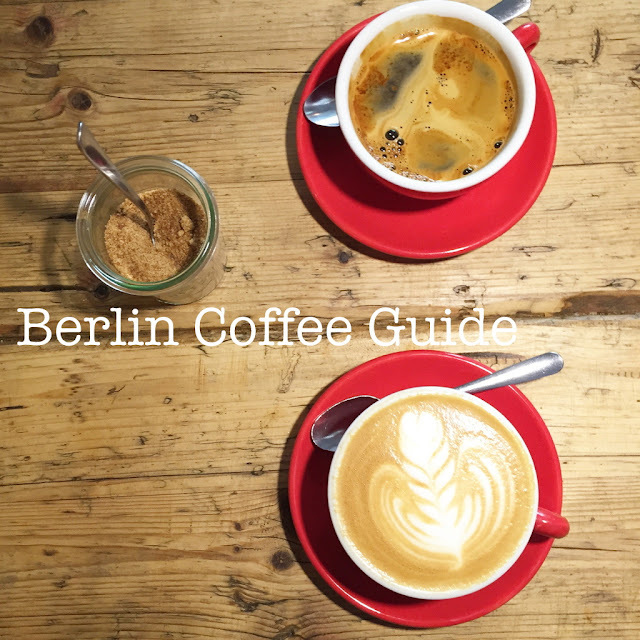 After having studied in Berlin for one year, I am now sharing with you my favourite coffee places that I am considering worth a visit. Come in for a relaxed afternoon, or to pick up a cuppa coffee to go and find yourself a comfy seat in a park nearby. You can choose between the following 11, or simply try all of them. A middle-sized cafe and micro-coffee roastery in Kreuzberg with a number of seatings, but still it is most of the time full on weekend. People come here for a nice cup of filter coffee (I had a great one from Ethiopia - Bifdu Gudina) or other specialities. Another thing that makes people return over and over again, is their heavenly cheesecake. Two locations not far from each other; one bigger - close to Rosa-Luxemburg Platz where you can see the roastery - and the other one, smaller, with some seating outside not far from the lovely Auguststrasse in Berlin Mitte, where you can find plenty of nice bars, cafes and restaurants. Coffee and its quality is most important here, so they don't have any fancy coffee-milk creations but just good, plain coffee prepared in many different ways. If you want to have your coffee as a flat white or a macchiato though, you can choose the amount of milk in your cup measured in oz. Try the flat white and a piece of their perfect carrotcake with roasted almonds and a frosting that is refreshing and not too sweet. + make sure to buy a bag of their freshly roasted and ground coffee. Australian place in the heart of Friedrichshain, serving a range of brunch dishes and great coffee. Their roasted coffee comes from several Berlin roasters, such as The Barn, and they have reached perfection in the art of properly preparing a flat white. Located on Oderbergerstrasse in the heart of Prenzlauerberg this cafe is the place to grab a coffee to go before heading to Mauerpark and to stroll through the fleamarket or listen to some Karaoke on a sunny day. The waiters are very easy going and are happy to prepare any kind of coffee for you, made of freshly roasted coffee beans. Nice place, wooden interior and some seating outside. Warm and cosy interior, coffee shop in a nice neighborhood in Prenzlauer Berg. Comfy interior, perfect for an afternoon chill, a good read or some studying. They even offer coffee workshops. Just a few minutes away from Godshot, also good for studying or working. Coffee is good, flat white could be a bit stronger though. Tiny coffee place/ espresso boutique selling tasteful and aromatic espresso (80%Guatemala, 20%Ethiopia) that are just waiting for you to pick one up in a cup to go and enjoy it next to the Landwehrkanal. Bead & breakfast and cafe. Got a coffee there once while on my way to Mauerpark, as it is right on the way from the metro station 'Eberswalder Strasse' to the park. Proper, strong, organic and tasteful coffee. Coffee stand in the Markthalle Neun, Kreuzberg. Make sure to get a sugared Focaccia (from the Italian shop/stand on the opposite) with you flat white made of coffee beans from a country of your choice. Small cafe in the Berlin Voo Store in Kreuzberg (which is selling great books, clothes, accessories btw.). You can relax here after a devastating shopping tour, while having an awakening flat white, or two to take over the world. Or decide for a 'plain' espresso to enjoy the aromatic taste of it to the fullest. Bakery and cafe in the heart of Berlin Mitte, selling a big range of insanely tasty cinnamon rolls. Get one with your coffee and you won't be disappointed.